Ok. Guys. This is THE HARDEST THING I HAVE EVER DONE that's nail related. I'm not even kidding! I'm not terrible at watermarbling BUT doing this clover-thingy was really getting me! I took 3 days, 9 cups, and 5 dips to get this, one that I only about 90% like. I'm calling at a win! Either my colors ran together, my clover disappeared when I tried to bring it together, I got numerous air and water bubbles, you name it. Basically every problem you could ever have watermarbling (that I don't usually have) I ran in to! I was determined to get on that was a least usable! 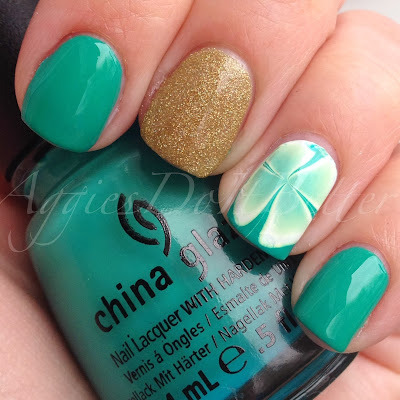 Aside from that, how gorgeous is China Glaze Four Leaf Clover??? This was on my wish list forever and I found it at a random grocery store for super cheap. Yay! This is my first time using it! The gold is CG Angel Wings. It dries a little matte, so I added topcoat to all nails. Then I added matte topcoat to it, because I NEED to get as much mileage out of this mani as possible! !